Superted In The Arctic: When SuperTed and Spotty take a break from playing their new video game "Knocking Mammoths off Icebergs" they discover being knocked off an iceberg is not much of a game after all! Superted And The Lumberjacks: Someone is cutting down the trees in the Wildlife Park. SuperTed and Spotty go to the aid of the animals whose homes are being destroyed and find lumberjacking is as simple as falling off a log! Bulk's Sto..
SuperTed and Nuts in Space: SuperTed is on the strange Planet Polly full of wild and weird parrots, but somebody has been intercepting the rockets that supply their only food...nuts. 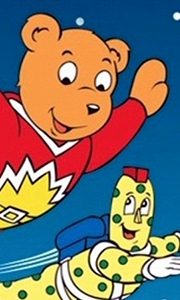 SuperTed on Planet Spot: Planet Spot is the source of magical cosmic dust. But the planet is not quite as friendly as it once was, when the evil Texas Pete gets up to his usual nasty tricks. SuperTed and the Pearlfishers: Texas Pete wants to take over all t..
SuperTed is one of the classic heroes of children's entertainment, and the adventures of the teddy bear with very special powers are available here for the first time on DVD. Join the intergalactic hero and his friend Spottyman in the three stories that see them taking on their old enemies, Texas Pete, Bulk and Skeleton. Trouble in Space, Part 1: SuperTed is involved in a rocket collision, which means he cannot remember the magic words ..
Own Superted Series 1 to 3 Complete Collection DVD from Deff, DVD, Blu-Ray & 4K Video Specialists - Free UK Delivery..